As I have mentioned earlier, i like eggs for their versatility. So I take chances to try different varieties with it. 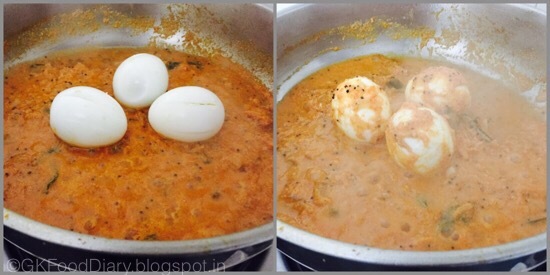 I often make this simple egg curry/egg kuzhambu/muutai kuzhambu as both hubby and me are big fan of it. 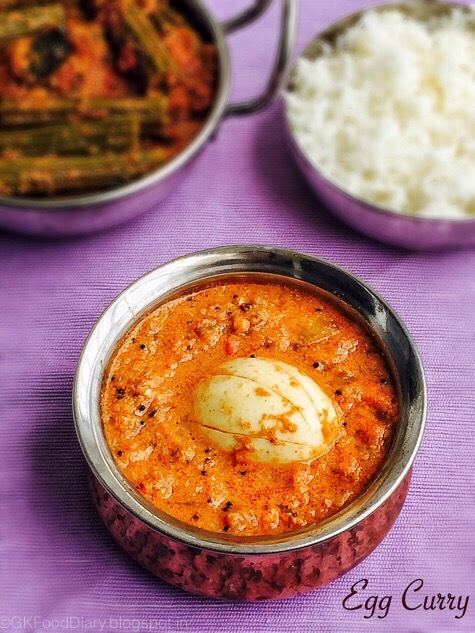 This egg curry is a great side dish for rice and even for chapatis. 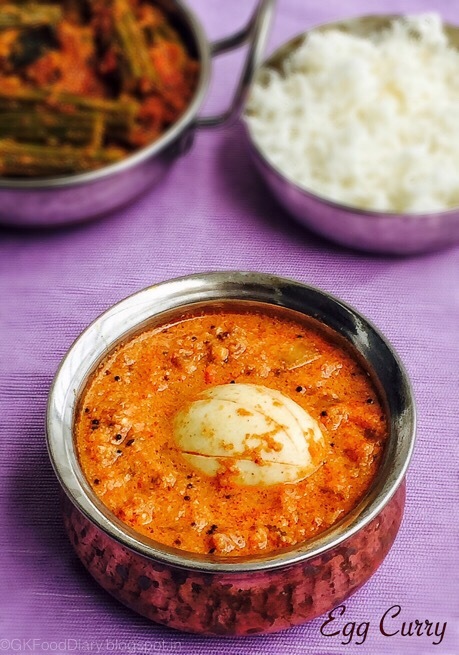 This is one of the easiest egg curry you can make in a jiffy. I will post different varieties of egg curry in this space soon. 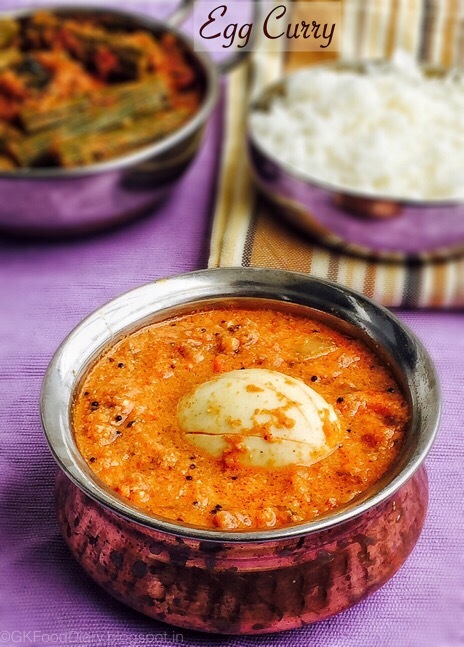 Lets check how to make this simple egg curry. 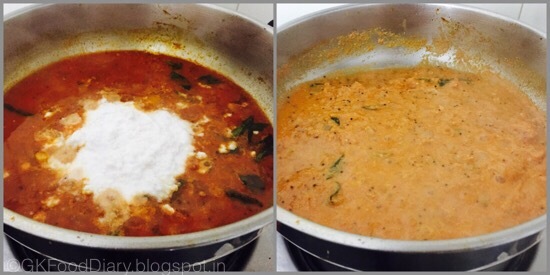 South Indian Style easy and quick curry made with boiled eggs and coconut. Put the eggs in a vessel with water till it immersed level. Boil eggs for 10 to 12 minutes in water. Cool it down and remove the shells once. Slit them vertically using a fork or knife. Keep this aside. 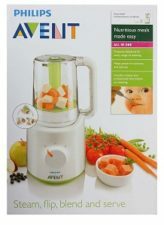 Grind everything in a blender to a coarse paste. Set aside. Chop the onions finely and keep aside. Wash & chop tomatoes roughly. Take them in a blender and grind it to a smooth paste. 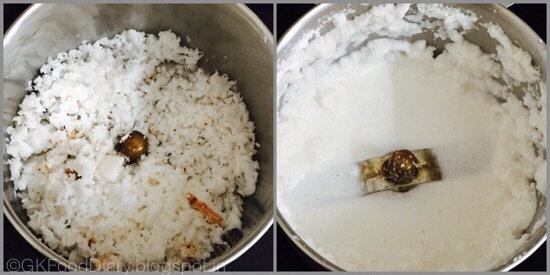 Grind coconut with little water to smioth paste. Set aside. Heat oil in a pan and add mustard seeds. Saute them until mustard seeds cracks. Add curry leaves and fry for a minute. Then add onions and saute them well. Once the onions becomes transparent, add the tomato paste along with red chilli powder, turmeric powder and corainder powder. Add required salt. 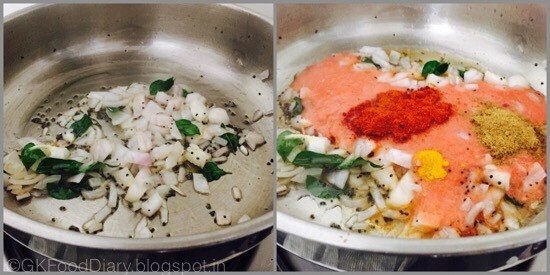 Mix well and fry the paste for 5 minutes in low medium flame until the raw smell of tomatoes leaves. Then add ½ cup of water.Mix well with the gravy. Boil the gravy in medium flame for 5 minutes or until it becomes little thick. By now the curry would become slightly thick. Now add ground coconut paste and carefully mix it with the curry. Boil it for another 5 minutes. Lastly add boiled eggs to the gravy. Mix well with the gravy. 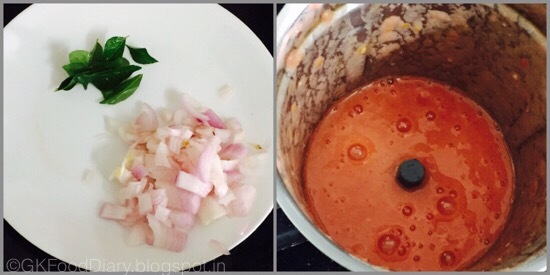 Boil the gravy for two more minutes and switch off the flame once done.Garnish with coriander leaves if you prefer. 1. Put the eggs in a vessel with water till it immersed level. 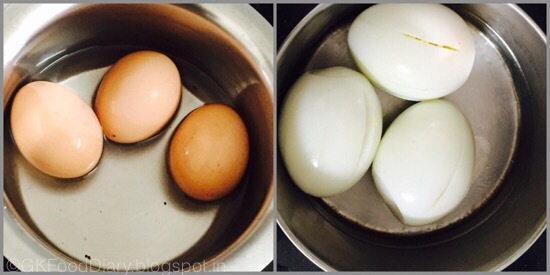 Boil eggs for 10 to 12 minutes in water. Cool it down and remove the shells once. Slit them vertically using a fork or knife. Keep this aside. 2. Grind everything in a blender to a coarse paste. Set aside. Chop the onions finely and keep aside. Wash & chop tomatoes roughly. Take them in a blender and grind it to a smooth paste. 3. Grind coconut with little water to smooth paste. Set aside. 1. Heat oil in a pan and add mustard seeds. Saute them until mustard seeds cracks. Add curry leaves and fry for a minute. Then add onions and saute them well. Once the onions becomes transparent, add the tomato paste along with red chilli powder, turmeric powder and coriander powder. Add required salt. 2. Mix well and fry the paste for 5 minutes in low medium flame until the raw smell of tomatoes leaves. Then add 1/2 cup of water.Mix well with the gravy. Boil the gravy in medium flame for 5 minutes or until it becomes little thick. 3. By now the curry would become slightly thick. Now add ground coconut paste and carefully mix it with the curry. Boil it for another 5 minutes. 4. Lastly add boiled eggs to the gravy. Mix well with the gravy. 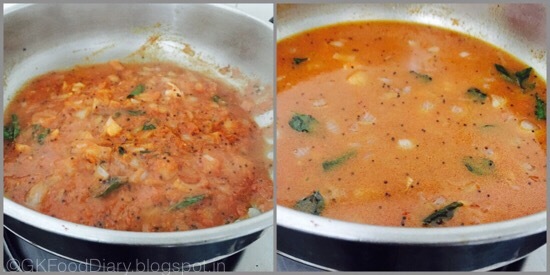 Boil the gravy for two more minutes and switch off the flame once done.Garnish with coriander leaves if you prefer. 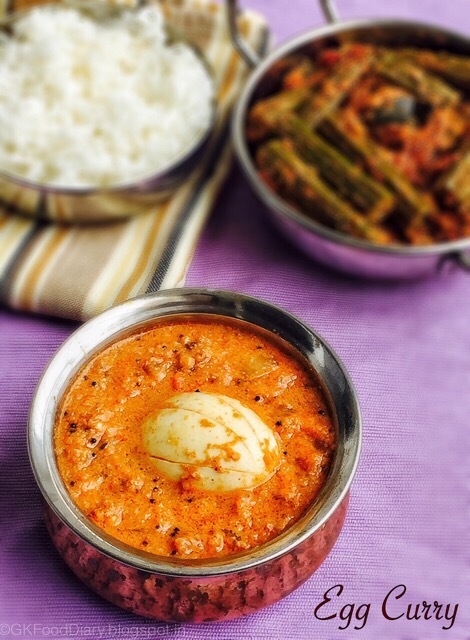 Serve the egg curry with hot steamed rice. We had it with rice and drumstick masala for lunch. Choose red ripe tomatoes with slight tangy taste to make this gravy.